DC eventually collected the entirety of Kirby's Fourth World stories -- including his work on The New Gods, The Forever People, Mister Miracle, Superman's Pal Jimmy Olsen, and the graphic novel The Hunger Dogs in four, full colour hardcover collections. The added gimmick was instead of simply collecting them series by series, the issues were collected chronologically, as though part of one series, so each omnibus features a mix of issues from the different series. I'd actually re-read a bunch of the issues that way myself earlier, as an experiment, and there is an effectiveness in such a presentation. The downside though, is that each volume doesn't contain an equal number of each series (the first volume features a dispproportionate number of Jimmy Olsen issues, the last volume Mister Miracle). The Death of the New Gods 2008 (HC & SC TPB) 256 pgs. Written, drawn by Jim Starlin. Inked by Matt Banning. In reviewing this I cite/reference a few other TPBs that are reviewed elsewhere on my site, but I was just too lazy to link to directly right now. But you can find them on the TOC. The Death of the New Gods is pretty much summed up by its title. Some mysterious adversary is going around murdering The New Gods -- including central, A-list characters. And those left (along with guest star Superman) try to figure out who -- and why -- before they're all dead. This is one of those stories which, frankly, it's kind of hard to review -- in part because I'm not sure why it exists. Why did DC's editorial staff decide a house cleaning was in order and Jack Kirby's Fourth World properties needed to be retired? I'm guessing this was during one of DC's seeming innumerable re-boots so it was figured it was okay to do a "last" New Gods story because they'd probably get rebooted in a few months anyway. But I'm not sure. Jim Starlin's involvement seems almost inevitable, of course. After all, Kirby's New Gods had a big influence on Starlin's classic Captain Marvel saga (usually collected as The Life of Captain Marvel -- and still one of the all-time great comic book epics). Although it's possible his only direct contact with the New Gods themselves was when he wrote the mini-series Cosmic Odyssey many years ago. And Starlin's bread and butter is doom n' gloom stories rife with a kind of faux-teenage angst and fatalism, full of cosmic suicides and death (heck -- one of his most famous works is, of course, The Death of Captain Marvel). Given this is an eight issue mini-series, with 30 pages per issue, and Starlin fully in charge as writer/artist, I had assumed this was some project Starlin brought to DC and was committed to passionately. But it's easy to forget that comic book creators only get paid if they, you know, create -- so it's equally possible Starlin just had nothing else on the stove. Or maybe the concept had been decided upon editorially, and Starlin was simply on a short list of writers to be offered the gig. The notion that Starlin might have been writing for a pay check might explain why, despite so clearly a part of his stylistic oeuvre, it feels a bit tired and pointless. Things had started even before this series with the murder of some New Gods (including Lightray) in some other comic or special. And the rest of the series is basically various New Gods being killed while a dwindling number (plus Superman) fight a seeming losing action to try and prevent more deaths and figure out who. Within an issue or two, Big Barda is murdered, throwing husband Miracle Man into a funk (and switching his normally bright costume for a dark hued one). And this is where you can see some of the problems -- its predictability, its triteness, its sense of same old same old, as though Starlin is cannibalizing his own works and recycling ideas from other entries in the "dark n' gritty" idiom. I mean, murdering Big Barda so that the normally up-beat Miracle Man can go all dark n' gloomy conjures up Identity Crisis (wherein Elongated Man's wife was murdered -- and worse). Meanwhile Starlin references his own Cosmic Odyssey in which he had introduced the idea that the anti-Life Equation (a recurring idea in the New God stories) was some sort of sentience. It didn't gel with anything that came before, and even Starlin has a character remark that everyone decided the theory was wrong. Only then Starlin stubbornly reintroduces the idea! Admittedly, my main knowledge of The New Gods comes from Kirby's original series and I'm sure they've been fiddled with and reinterpreted by others over the years. But I didn't feel that Starlin had a great feel for them -- either as characters (dialogue often seeming incongruous for some) or the spirit. As I said: the original comics clearly influenced Starlin in the 1970s -- but that was decades ago and it's possible he's struggling to reconnect with his earlier self's enthusiasm. That could explain why one of the problems is that the saga never really feels filtered through the personalities. The characters often feel like pieces moved about a board rather than personalities who are driving the story. And that may be why he just rewrites Mister Miracle by having his grief turn him into largely a different person. Of course, in a story where characters are just there to be killed off, maybe Starlin was reluctant to get too engaged by them. But, equally -- this is supposed to be their swan song. Not that Superman fairs much better, personality wise. He seems to be there simply to provide a focal character who can stand back from the story and isn't on anyone's hit list. But as a story, it never really becomes that unexpected. That's why I could imagine Starlin was more just churning this out to please an editor -- crossing his "t"s and dotting his "i"s. There's little that's imaginative or unexpected in how the story unfolds. Given this is a threat to all the New Gods, maybe it would've been interesting to have the heroes and their hereditary foes from Apokolips grudgingly team up (Orion and Kalibaak go off on a mission while Metron and Desaad work on a formula); or given Kirby's original vision was spread across different series (New Gods, Forever People, etc.) Starlin could've structured his story so we cut between the different players in parallel storylines (maybe akin to his Mystery In Space series)..
Now, obviously, you should review something for what it is, rather than what you would like it to be. But my point is Starlin's approach to the story is fairly straightforward and unsurprising. Even some of the twists and revelations that occur were often things the characters (or the reader) had already known (or seen) earlier. Art-wise, Starlin is a veteran artist so most people will probably already have an idea on where they stand with him. It has Starlin's strengths (lots of detailed environments, lots of firmly rendered, muscular figures) and his weaknesses (overly-muscled figures often stiffly posed and with faces given to generic expressions). The composition tells the story without (off the top of my head) any particularly memorable images or panel arrangements (such as I associate with his long ago Warlock stories from the 1970s). Philosophically Starlin seems to exist in an odd place. His stories often criticize and satirize religion. But equally there's often an underlying suggestion of some greater meaning to life, as if a higher power/purpose dictates characters' actions (I suspect Michael Moorcock was an influence on Starlin). This imbues his stories with both a fatalism/nihilism (we are helpless pawns) and an almost religious optimism (even death has meaning). Sometimes this leads to Starlin positing intriguing (if debateable) philosophies -- where what is "good" and what is "bad" become ambiguous. These contradictions are on full display here as the New Gods find themselves both betrayed by the very forces they thought they served -- even as the saga ends suggesting it was perhaps in service of a higher good. But it also means Starlin's stuff can fall victim to the very religiosity he satirizes and criticizes. By the end it can feel like plot and human emotion has been sacrificed for a philosophically vague sermon. Which, depending on your perspective, can render the whole as being full of sound and fury...but signifying nothing. 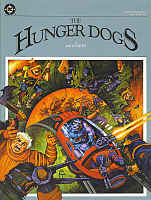 The Hunger Dogs 1985 (SC GN) 64 pgs. Written and pencilled by Jack Kirby. Inked by D. Bruce Berry, Mike Royer, Greg Theakston. Colours: Greg Theakston, with Bill Wray, Tony Dispoto. Letters: Berry & Royer. Editor: Joe Orlando. Most people see the New Gods (and its related series, generally labelled as The Fourth World Saga) as Jack Kirby's crowning achievement in comics. Initiated when Kirby left Marvel for DC Comics in 1970, the New Gods was a wildly imaginative -- and, like many of Kirby's solo efforts, a frustratingly undisciplined -- saga involving rival space gods from the planets New Genesis and Apokolips. Though coming to be seen as Kirby's masterpiece, initially the New Gods (as well as its companion series The Forever People and Mister Miracle) were not a commercial success, with the longest running one -- Mister Miracle -- the least ambitious of them. There was a subsequent post-Kirby revival (by Conway and Newton) but it didn't fair much better, leaving the New God concepts to flitter about the peripheries of the DC Universe, with its most significant contribution being arch-fiend Darkseid. Then in the mid-1980s, DC re-printed Kirby's 11 original New Gods issues in a 6 issue deluxe format reprint series, including giving Kirby the opportunity to add a new story to that sixth issue -- a story that, as it turned out (when I finally read it) was disappointingly thin and inconclusive. That's because it was really just intended as a tease to lead into this -- The Hunger Dogs. A sixty four page graphic novel intended as Kirby's final hurrah with his New Gods concepts. At least that was the intent. But as always with Kirby, the promises made to him weren't quite fulfilled, as what was supposed to be his visionary resolution to his creation was, once again, interfered with by editorial edicts -- apparently after it was discovered Kirby intended to kill off major characters. And as DC still saw them as marketable properties, that was a no-no. (Nowadays, they'd probably have let him do it, then just publish it as an apocryphal tale). How much such interference impacted on the finished work is hard to say. Because the Hunger Dogs is weird, confused, undisciplined, illogical...but that can kind of be said of many of Kirby's solo works, even those -- or especially those -- in which he was given total creative freedom. So like the worst of Kirby's stuff, the Hunger Dogs is a bit of a mess. And like the best of his stuff, that very messiness can lend it the faint shimmer of brilliance. Despite being a "graphic novel", and with its own title (as opposed to calling it "New Gods: The Hunger Dogs"), this isn't really aimed at people unfamiliar with the New Gods in general -- and, indeed, probably benefits from knowing a few particulars (such as having read that new story Kirby presented in the sixth issue of the New Gods reprints...which explains why nominal hero, Orion, is already on Apokolips, and wounded -- not that it's that important to following this story). At the same time, it's a broad canvased epic, developing and exploring themes introduced here (even as they were themes common to the New Gods) and in which it's more an ensemble than anything where there is a clear main character or "hero". The themes, as with the New God, are very much about tyranny, mechanization, dehumanization. That was always a subtext -- the industrial hell of Apokolips vs. the bucolic New Genesis -- but now where even evil Darkseid begins to feel as much a prisoner of progress as an instigator, in danger of becoming Last Year's Man, as his weaponsmith begins turning out newer and more vile technology to be used against New Genesis -- "You expect me to sanction...this filth?" he demands. But, of course, he does. Meanwhile, the hunger dogs -- Apokolips' peasant class -- are growing more and more unruly, threatening rebellion against Darkseid's dictatorial rule, given support by Orion, and by Himon, an Apokolipian revolutionary first seen in a Mister Miracle issue. There are appearances by Highfather and Lightray, and even allusions to Metron, whom Kirby dropped rather unceremoniously in his old New Gods run (Kirby seeming to basically ignore Conway's and any other contributions to the mythos in the fifteen years since his original series). As I say, The Hunger Dogs is often confused and muddled, but whether that's a fault of editorial interference, or Kirby's own creative impulses, is hard to say. Certainly some of the problems seem less to stem from a change in story direction, and more as though Kirby thought he would be working with twice the number of pages as he was, and so shoehorns in ideas rather willynilly. And Kirby's work has often suffered from a sense he has too many ideas, and too little discipline, and from an ability to write some dramatic, profound monologues in one panel...and some clunky, laughably clumsy sentences in another...and in a third, something you can barely make heads nor tales of! Visually, I wouldn't really define this a s Kirby's peak period, his craggy, raw style a bit of an acquired taste to begin with, and here maybe seeming less polished, less detailed. As well, despite Kirby being a comic book innovator, literally blazing stylistic and compositional trails for succeeding generations of artists, he seems a bit unsure what to do with the visual freedom of the graphic novel -- the over-sized pages, the extra length, the richer colours. A lot of the scenes are pretty straightforward, while when he does indulge in experimentations with panel arrangement it can be a bit confusing, as if he was doing them just to justify the format rather than because it works. Still, it's decent enough, telling the tale, with Kirby evoking the awesome fatalism of the Apokolips landscape better than many artists who came after him. And as probably the first Kirby project given the semi-painted, multi-tone colouring look, it's not uninteresting. And the colours add a layer of sombreness to it all. In that weird, hit and miss, slightly mad Kirby way, there can be a genuine power to the Hunger Dogs. The story is suffused with a bleak melancholy, an apocalyptic aura, a sense this really was Kirby's swan song with the property -- and he meant it. Like the best of Kirby's New Gods run, there are richly dramatic moments, some quite powerful, and a sense that he really is pouring out his heart and soul, that the themes aren't merely pseudo-pretensions to jazz up the action scenes. As a climax to the New Gods saga, it doesn't entirely satisfy (there's no Orion/Darkseid showdown -- presumably by editorial edict), yet at the same time, in its mad, Kirby-esque way, it sort of does, too. There's a haunting atmosphere, of endings and beginnings, and a sense of brooding profundity. In a way, the Hunger Dogs ends the New Gods -- or at least Kirby's involvement with same -- as it began, a wild mix of strengths and weaknesses, which combine to seem greater than its flaws. And maybe it shouldn't have been any other way. Original cover price: $5.95 USA. Jack Kirby's Forever People 1999 (SC TPB) 288 pgs. Written, drawn and edited by Jack Kibry. Inks by Vince Colletta, Mike Royer. Colours: grey shades. Letters: unbilled. Additional notes: intro by Mark Evanier. I had never quite been a Kirby fanatic the way others are. Although I've liked his craggy, stylized art, there were plenty of artists I preferred, and the few comics I'd read that were actually written by him, though not without some appeal, often struck me as childish and simplistic with clunky dialogue. But when I picked up Jack Kirby's New Gods, the first collection reprinting his original run of stories from the the early '70s, I was dully impressed. I finally "got" it. Here was the Kirby his fans talked about, wild and untamed, full of big ideas and emotions. The Forever People was one of the companion series to the New Gods, following different protagonists, but caught up in the same conflict between the worlds of New Genesis and Apokolips, with earth the battleground. Like Jack Kirby's New Gods, Jack Kirby's Forever People reprints the original run of the title in its entirety, along with a few back up stories, cover gallery, and an introduction by Mark Evanier, comic writer and Kirby insider. Once again the stories are reprinted in black and white, but using grey shades that give the pictures a far more expressive and striking appearance than if it was simply black lines on white paper. The heroes are the Forever People -- Mark Moonrider, Big Bear, Vykin the Black, Serifan, and Beautiful Dreamer, young New Gods from New Genesis who were clearly Kirby's attempt to evoke a kind of hippy-like heroes (earth characters even deried them as "hippies"). More optimistic and naive than, say, Orion, who is the focal character in The New Gods, the Forever People carry on their own fight with evil Darkseid who is searching for the anti-Life formula which will grant him control over all living beings. The first issue (guest starring Superman) starts out well, and there's a definite appeal to the cheery guilelessness of the Forever People and their pseudo-hippy attitudes (if a movie were made about the characters, you could picture Joan Baez playing on the sound track). But the series hits its stride in the third issue with a multi-issue epic as the Forever People become prisoners of Darkseid and his maniacal chief scientist, Desaad, and we are introduced to Glorious Godfrey, a rabble rousing pulpit pounder who preachess the gospel of anti-Life in Darkseid's name. If the innocence of the Forever People seemed to imply a lighter series than The New Gods, then this story dispells that. It begins with a quote from Adolph Hitler, and is a twisted, nightmare journey through a torture chamber that masquerades as a fun park, and posits provocative questions about morality, personal responsibility and the mob mentality. It runs for a few issues, taking a few twists and turns, culminating in some time travel. This is followed by a one-shot issue in which we finally see the power of the anti-Life formula in the wrong hands -- and Kirby truly convinces us that Anti-Life really is the cosmic threat Darkseid hopes it will be. After that, though, the series stumbles a bit. The next two issues guest star Deadman in a couple of interconnected, but separate stories. Kirby, apparently, was under pressure to throw in a guest star and to try and kick start the character whose stories (in Strange Adventures) had recently been cancelled. The result is unsatisfying, for a number of reasons. Perhaps the Forever People worked best focusing on their war with Apokolips. And Kirby's attempt to reinvent Deadman seemed kind of extraneous. The stories end with Deadman, potentially, having a super powered body he can permanently inhabit -- thereby losing the whole uniqueness of being a ghostly hero -- and once more setting out to find his killer who, apparently, wasn't who he thought he was. Subsequent Deadman stories, I believe, have tended to ignore these stories. There are still some interesting ideas, but it lacks the bite of the earlier stories. The final issue is kind of odd in that both the New Gods and The Forever People were cancelled prematurely, and I assumed unexpectedly. But this certainly seems like it was intended as a last issue. Presumably Kirby saw the writing on the wall. Although, the "end" may simply have been intended to presage a new direction for the series. It's not an entirely satisfying end, seeming hastily cobbled together, but it allows the book to close as if it was meant to, not as if it was cancelled in mid-story. Though some years later a follow up mini-series, not done by Kirby, revisited the characters. Like Kirby's other work, The Forever People has strengths and weaknesses. On one hand, there is a raw virality at work, a seeming evidence of genuine passion on the part of the creator. There is an appealing sense the comic, and the characters, were very much a product of their time. Still, there is an undisciplinedness to Kirby's work, perhaps a fault of having a guy be his own editor. Ideas come and go, willy nilly, as Kirby seems to throw in a story concept...then drop it the next issue as some new fancy strikes him. Although there is a power to his writing, and a maturity that I didn't expect, at other times there is the juvenileness that I'm more accustomed to from some of his other solo work, and clunky dialogue. And although the Forever People gradually emerge with their own personalities and quirks, after eleven issues, there's a feeling Kirby has only brushed the surface of them and their relationships. Another writer might have provided as much delieanation in half the number of issues. His portrait of Darkseid, however, is a surprisingly compelling, complex character -- far more so than any other writer I've come across who's tackled the character in the decades since Kirby. The scenes between Darkseid, Glorious Godfrey and Desaad show more attention to subtly shading the villains than is common in a lot of comics. Darkseid, surprises of surprises, actually turns out to have (some) principles! Ultimately, the Forever People is maybe a tad more uneven than The New Gods, but it is still an appealing, at times powerful and complex saga as guileless innocence meets corruption incarnate. Cover price: $23.50 CDN./$14.95 USA. Written and pencilled by Jack Kirby. Inks by Vince Colletta, Mike Royer. Black & White & Grey. Letters: unbilled. Reprinting: Mister Miracle (1st series) #1-10 (1971-1972) plus some short, back up stories. Additional notes: introductions by Mark Evanier and magician David Copperfield; cover gallery. Continuing DC Comics re-presentation of Jack Kirby's critically regarded early 1970s comicbook epic, depicting various aspects of the war between the God-like denizens of the planets New Genesis and Apokolips with earth caught in the middle -- commonly known as the Fourth World saga -- this collects the first ten issues of Mister Miracle -- reprinted in black and white, but effectively textured with grey shades. I had already read two other collections in the series, The New Gods (the flagship title) and The Forever People by the time I started on this. Mister Miracle introduces us to the enigmatic Scott Free, living on earth, who takes on the mantle of a murdered showman and escape artist (Scott demonstrating a particular knack for daring -- and miraculous -- escapes). Paired with the dead man's aassistant, the little person, Oberon, Scott battles an array of bizarre villains sent from Apokolips to hunt him...Scott having escaped from that planet. After having read two books in the series, it's hard to know how to read Mister Miracle. The three comic book series were interconnected...but also, sort of, self-contained. As such, I'm not sure how much pre-knowledge Kirby expected the reader to have as vague hints are dropped alluding to Apokolips. Are the references supposed to be mysterious? Or is the reader expected to know what they mean? If the former, it means the early stories can seem a bit bland to more knowledgeable readers, as the "mysteries" aren't really mysteries...but if the latter, I'm not sure the reader gets all the information he or she would want just in these pages. For example, Scott's true lineage, I believe, is revealed in The New Gods, but not here! I had mentioned in my review of the other books that prior to reading the Fourth World stories I had mixed feelings about Kirby's work as a writer, feeling he tended to lean toward half-baked plotting that seemed more an excuse for one outrageous action scene after another and thin characterization. An overall juvenileness. But I was duly impressed with the New Gods and The Forever People. Sure, some of that remained, but it was overshadowed by more thoughtful scenes, and grand ideas and an epic scope. Unfortunately, Mister Miracle reminds me a little more of the Kirby I expected. The first issue kicks things off well, with a kind of low-key, moody tale, as we meet Scott as an aimless drifter who stops to watch an escape artist testing his latest trick in a remote field. Scott becomes involved with the escape artist's conflict with a mobster, but it's the characters who stick in your mind. But then the stories just become a parade of bizarre and outrageous villains showing up with no other plan than to capture or kill Scott, employing various death traps -- all of which Scott escapes with an almost complete disregard for logic, or even explanation at times. Mister Miracle is sub-titled "Super Escape Artist", but Kirby seems to have little interest in, or aptitude for, coming up with ingenious escapes. Unlike Batman, whose contemporaneous stories often detailed how he escapes from traps, Kirby just out-fits Mister Miracle with an array of tricks and devices that come into play conveniently when the need arises. Even when he uses something that he used before, it often has a new property that wasn't foreshadowed earlier. In other words, the plots aren't much more than showcases for the action-escape scenes...and those scenes aren't much either. However, just when things seem a mite bland, the series picks up. The first half of stories takes place on earth, with Scott battling various Apokolipian villains, or getting involved with an earth con man, Funky Flashman and his snivelling sidekick, House Roy -- a seeming mean-spirited jab at Kirby's old Marvel collaborator Stan Lee, and fellow Marvel writer, Roy Thomas. For those who take Kirby's side in the question of how much he did at Marvel, and whether Lee stole credit for Kirby's genius, it might seem like amusing payback, but for others, the story might seem just a little petty and childish. Particularly as I don't think one can read Kirby's solo stuff (like this) and not be forced to concede that Kirby's Marvel stuff had a different -- certainly more disciplined -- flavour that hints Lee must've been contributing something. Anyway the series picks up when Kirby finally shifts the action to Apokolips itself. Although Apokolips had been glimpsed in the New Gods and the Forever People, I think this is the first time Kirby really presents the world -- and it's a strangely powerful, disturbing sequence. Mister Miracle returns to Apokolips to confront his pursuers and his journey through this chilling police state is dramatically quite powerful. As well, the villains from earlier issues re-appear, but here evince more character and nuance when seen in their native habitat. Kirby then indulges in a flashback issue (like he did in The New Gods' "The Pact") as we see Mister Miracles' youth, and how he encounters Himon, a rebel of Apokolips who takes him under his wing. It's an effective, stand alone tale, perhaps on a similar level of quality as The New Gods' "The Pact". The final story has Scott returning to earth for an adventure that has nothing to do with Apokolips...and is fun precisely for its originality (though still suffers from erratic use of logic). And, as it reunites the protagonists, acts as a satisfying conclusion to the TPB. In addition to the plotting, the character stuff is likewise made up of strengths and weaknesses. Scott, himself, is kind of a generic leading man, but Oberon is ingratiating, and the introduction of Big Barda, a warrior woman from Apokolips who is Scott's friend (and maybe lover) gives the series a decidedly flamboyant, loud personality. And she's a major departure from Kirby's usual, more passive heroines. Once Scott's blandness can be contrasted with Barda's aggressiveness, and we learn more of his history, Scott too becomes more interesting. The first issue of Mister Miracle is good, and the last four in this collection boast some exceptional tales, though in-between there's a certain mediocrity. Though it might be interesting to re-read the the stories in this book in their chronological order (reading the few "Young Scott Free" shorts included here, and "Himon" before starting on issue #1) and see if that changes how the saga reads. Ultimately, Mister Miracle comes in third behind the New Gods and The Forever People, but it has its moments, and the run of issues #7-9 adds texture to Apokolips for completists. It's ironic that the original runs of The New Gods and The Forever People were cancelled after 11 issues...but Mister Miracle, in my opinion the lesser title, managed to continue to #18. Issues #11-18 have been collected in what DC initially billed as the final Fourth World TPB...Jack Kirby's Fourth World. Susbsequently, DC did release a couple of colour TPBs of his Jimmy Olsen stories which, though not as intricately tied into the Fourth World saga, nonetheless first introduced the ideas. Still later, DC released a series of full colour, hardcover Fourth World Omnibuses which published all four series, including a story Kirby did for a 1985 reprint series, and the graphic novel The Hunger Dogs, in their chronological publication order -- so each volume doesn't just reprint one of the series, but is a mix of the various series. Funnily enough, before DC did that, I had actually tried that on my own, re-reading the three TPBs I had of The New Gods, The Forever People and Mister Miracle, crossing back and forth between them as though one series -- and they do read even better that way, with even the breezier Mr. Miracle issues gaining from the association (acting as counterpoints to what was happening in the other series). Jack Kirby's Mister Miracle is uneven, but moderatelyenjoyable, particularly read as a companion piece to the other TPBs, and it has enough interesting bits to make me consider getting Jack Kirby's Fourth World...but enough weaknesses that it's not a priority. Cover price: $18.95 CDN./ $12.95 USA.